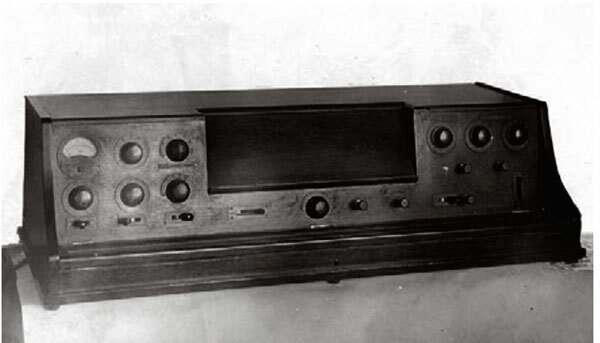 The “Sonar” was a monophonic heterodyning vacuum tube instrument developed by Nikolai Anan’yev at the GIMN Acoustic Laboratory in the USSR from 1930. The Sonar used the same heterodyning principles of Termen’s Thereminvox but with the addition of a fretted fingerboard to vary the pitch of the oscillator. This addition made the Sonar more popular (at the time in the early Soviet period) with musicians than the Thereminvox due to it’s familiarity and playability. The Sonar was said to have been able to reproduce violin like timbres as well as simple speech phrases such as “mama”, “papa” as well as conventional instrumental sounds and became known for it’s use in ‘proletarian’ outdoor events. Anan’yev gave over six hundred concerts to around five hundred thousand people with the Sonar during his lifetime. Sound in Z: Experiments in Sound and Electronic Music in Early 20th-century Russia. Published by Walther König, Köln. Edited by David Rogerson, Matt Price. Foreword by Jeremy Deller. Text by Andrei Smirnov.